Time Off is built using the robust Metadata Framework within SuccessFactors, which gives great flexibility to set up and administer the system based on various elements of Job information on each employee. One example would be the assignment of a Holiday schedule based on the country in which the employee works. Another would be the assignment of new hires into the correct Vacation plan for their job category (Executive vs. Hourly), including the calculation of their pro-rata allowance for their first year of employment or the ability to know exactly how many hours a terminating employee has left in their accrued time in order to pay them out accurately. The real “Wow” factor for most employees and managers is in the intuitive and easy to understand User Interface for Time Off. Each employee can see what types of time are available to them, as well as all time requests that have been submitted and approved. A really nice feature of Time Off is the ability to permission users to see the complete “Team Calendar” view, which shows them their peers and who has also requested time during the same period. 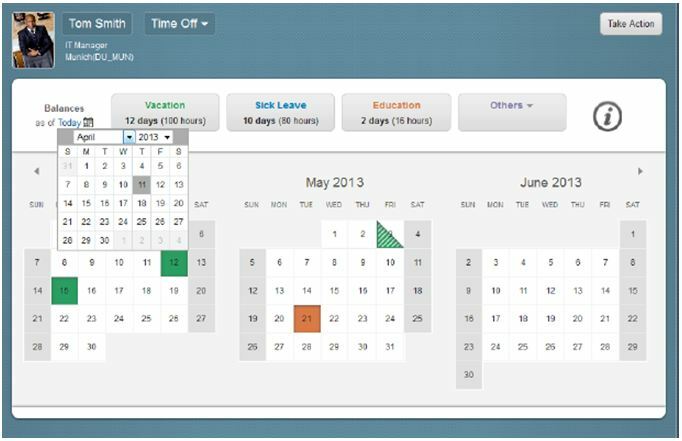 Managers enjoy the easy to use administration Interface, called Manage Time Off. This summary shows the various plans Time Accounts that each employee is enrolled in currently, as well as the details of that specific time account. 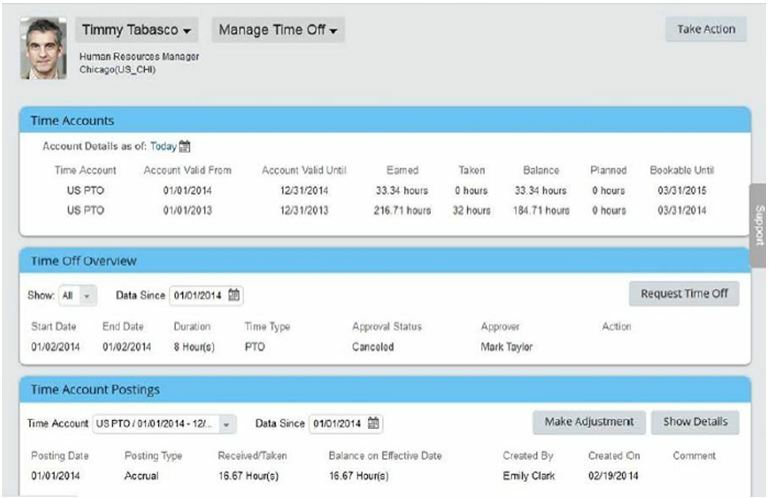 The Time Off Overview portlet shows the occurrences of Time Off requests for the employee and the details around it. The Manager or Admin can create a Time Off request from this screen, allowing them to ensure entries are made on behalf of the employee if needed. The final section of this screen allows visibility into very granular information on each time account and offers the chance to make adjustments to them without having to go through another step. Common reasons for adjustments might be to “give back” time that was requested and approved, but ultimately not taken. Or, it is a way to adjust the account for someone who made errors when entering requests initially. This flexibility puts the tools into the managers’ hands, which helps keep this information accurate and up to date. There are a number of delivered Standard Reports to allow both Managers and Administrators to audit the Time Off process. These include different views of time by individual employee or by a large work group such as a division. Access to these reports is granted through the SuccessFactors Role-based Permission framework, which ensures that employees’ data is only available to their managers or the company administrators. This entry was posted in SuccessFactors Tips & Tricks and tagged Employee Central, SuccessFactors, Team Calendar, Time. Bookmark the permalink.